"Waterside" is a thirteen lot development of custom homes by Belcor Builders. 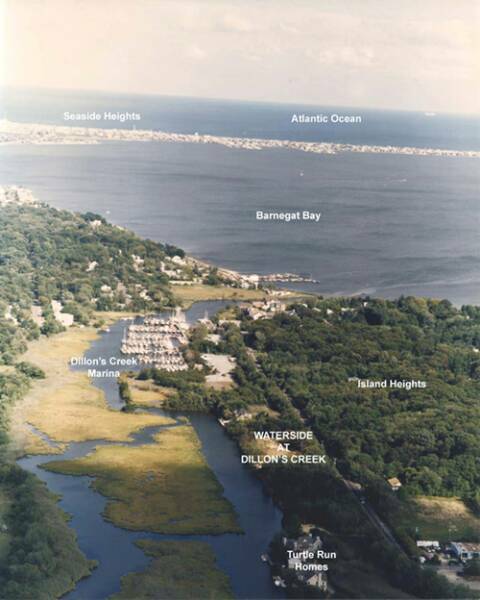 They are to be constructed along the Dillon's Creek in Island Heights, New Jersey. Let us design for you a "one of a kind home to meet the needs and lifestyles of your family. If you can think of it we can probably do it. Just up water from the Dillon's Creek Marina and a five minute direct access ride by boat to the Toms River and Barnegat Bay. A slightly longer ride to one of two outlets with access to the Atlantic Ocean. The homes will be built accross from a wildlife preserve where nature can be viewed with all of it's beauty and serenity and on a waterway deep enough to accommodate up to a fifty foot boat. If a beautiful sandy beach is what you are looking for, a fifteen minute drive by car will bring you to the sandy beaches of Seaside or Island Beach State Park. And although there is plenty of nightlife activity in the surrounding areas if you are looking for the night lights and top name entertainment Atlantic City is just fourty-five minutes away.